Toshiba this week introduced its new Portégé X30 lineup of notebooks designed for business and enterprise users. Three models will be on offer, powered by Intel’s Kaby Lake-U SoCs and they come equipped with up to 16 GB of memory, up to 512 GB of SSD storage, Thunderbolt 3, WiGig connectivity (optional), harman/kardon speakers, and security features such as an IR camera, a fingerprint reader, and a TPM 2.0 module. The weight of the clamshell is just around 2.3 pounds (or about 1.05 kilograms), among the lowest in the industry. Now focused primarily on business notebooks rather than laptops for consumers, Toshiba does not make many PC-related announcements these days. Nonetheless, the company continues to develop ultra-portable laptops to compete against rivals. In this space, models such as Lenovo’s ThinkPad X1 or Dell’s XPS 13 reign supreme. 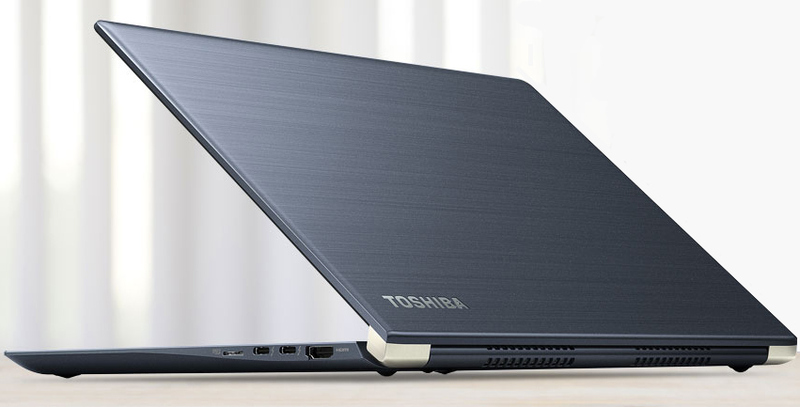 So this week, Toshiba launched its new Portégé X30 13.3” notebook that combines high performance, connectivity, and security with a low weight that is among the lowest in the class. To reduce the weight of the notebook to around a kilogram, Toshiba used a magnesium alloy for the chassis. This increased the thickness of the laptop to 15.9 mm, but it looks like Toshiba decided that weight reduction and durability is more important than ultimate portability at any cost. 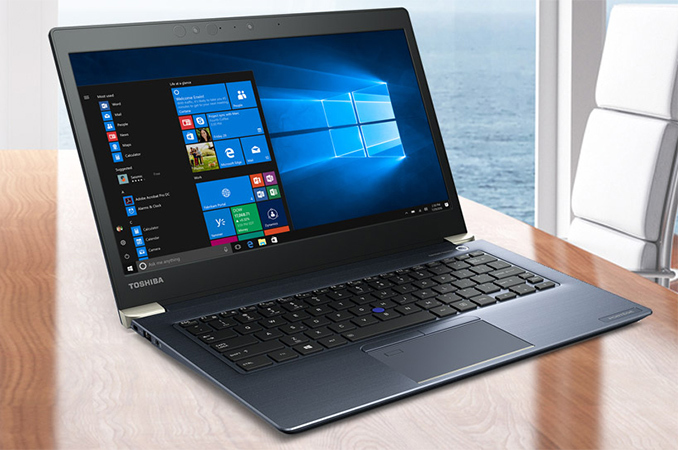 The Toshiba Portégé X30 is based on Intel’s Core i5/i7 processor with built-in HD Graphics 620 and Microsoft’s Windows 10 Pro operating system. Depending on the version of the PC, the Portégé X30 can be equipped with 8 or 16 GB of DDR4-2133 memory, and a 256 GB or a 512 GB PCIe SSD. When it comes to connectivity, the new notebook is equipped with an 802.11ac Wi-Fi + BT 4.1 wireless module, optional WiGig (select built-to-order models only), one HDMI output, a microSD card reader, two Thunderbolt 3 ports that can work in DisplayPort 1.2 and USB 3.1 Gen 2 modes, and one USB Type-A header. For security features, the Portégé X30 is equipped with SecurePad with Synaptics Natural ID fingerprint sensor, a webcam with IR sensors (for facial recognition) as well as a Trusted Platform Module (TPM 2.0). For added comfort, the notebook comes with a backlit, spill-resistant keyboard with a trackpoint nub. As for multimedia capabilities, the system has a stereo sub-system featuring speakers co-designed with Harman Kardon that also carry a DTS label. Toshiba’s Portégé X30 laptops are available directly from the company in the U.S. for $1450, $1600 or $1900, depending on configurations. 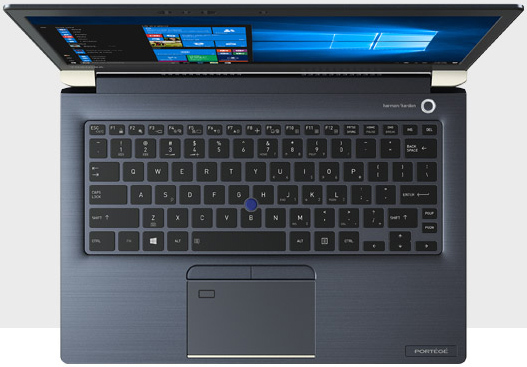 Toshiba sells its Portégé notebooks in other regions as well, albeit in different configs (e.g., machines with a 1366×768 resolution and lower-end CPUs) and at different price points. I have always hated toshiba laptops as a technician, but general users love them. That's why I continue to see them. They are a complete nightmare to work on, burying the hard drive inside case of some models requiring removal of the motherboard and 40 dislike-sized screws, and lots of cheap plastics. But they are reliable, lightweight, and often built in Japan.